There are groovy pants, funky pants, cheeky little monkey pants, loose pants, tight pants and lighting up at night pants. There are pants for being lazy, and pants to pick a daisy! But which is the perfect pair of pants for YOU? Get ready to roll round with laughter at this exuberant favourite, written in the style of a playground rhyme. 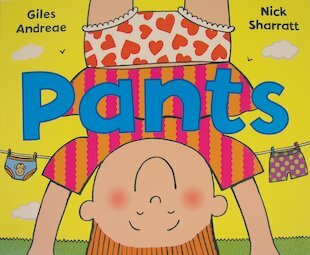 Giles Andreae and Nick Sharratt put their combined gift for silly slapstick to wild and wacky use, celebrating pants of every kind! I LOVE this book. i read it again and again, i just love how many different types of pants there are!!! i am a bit babyish i’m 12 (i got this when i was 4) but i just think some people like books that stay with them for ever, it’s like their a part of you. This is about different types of pants.